The traditional patrons of James Pulham and Son were beginning to feel the strain of the growing financial pressures of the early 1900s, but this was compensated to some extent by the advent of the railways, and the ability of people to travel more easily to coastal resorts. The Corporations of a number of these towns engaged the firm to ‘beautify’ their attractions by the creation of new gardens etc – a pattern established by Ramsgate in 1894, when the Pulhams built the rockwork along Madeira Walk, as described in Chapter 21. 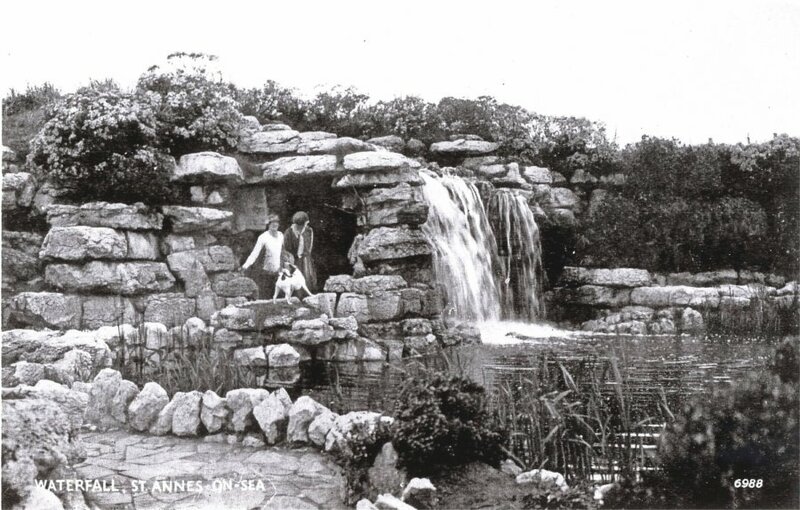 In 1914, the Lytham Council – now combined with St Annes to become Lytham St Annes – engaged the firm to build two waterfalls on the new lake in the Promenade Gardens. They were then invited to lay out a rock and water garden in the St George’s Gardens – later to become known as the Ashton Memorial Gardens – where they erected a typical ‘Pulham bridge’ and arranged rocks to simulate natural geological strata around the irregular shoreline of the lake. This was fed by a cascade and waterfall at the southern end, and much of the rockwork still survives today – the water supply having been reconnected during a recent restoration programme. They then laid out and planted both the Rock Garden and the Rose Garden, and made some alterations to the Waterfall on the South Promenade. A full description of the work done by James Pulham and Son at Lyrham St Annes – together with a number of pictures – can be found in Chapter 37 of Rock Landscapes: The Pulham Legacy – the critically-acclaimed and lavishly illustrated definitive story of the lives and work of James Pulham and Son. Written by Claude Hitching, with featured photography by Jenny Lilly. Published by Garden Art Press. Posted on October 8, 2014 June 30, 2016 by Claude HitchingPosted in Book ContentsTagged . . James Pulham and Son, Ashton Memorial Gardens, Claude Hitching, Promenade Gardens, Promenade Gardens - Lytham St Annes, Pulham bridge, rock garden, Rock Landscapes: The Pulham Legacy, rose garden, waterfall.